he/she entered the grounds of the State Buildings. The Indian Territory was a large tract of land west of the Mississippi that was set aside for the relocation of five tribes of Indians. Overlooking the lawn were the great trees that shaded the two stories building that covered an area 109 by 72 feet and cost 15,930 dollars. it was one of the most dignified of state structures, in the style of a Southern mansion. It represented the rise and progress of the future commonwealth. The buildings southern room contained children's art from the Indian schools. In another room, over 500 photographs of the vast resources and industries of the Territory and scenes from the principal cities and towns. Also, one could view a portrait of Thomas Jefferson painted by a Cherokee squaw as well as fine bead work. The second floor of the Territory Building contained a large reception hall, ladies' parlors and resting rooms, and the offices of the executive commissioner. An especially attractive feature about the pavilion were the large stair landing and the five big windows, two transparencies being set in each and representing typical scenes from the Territory. furnishings were all manufactured by pupils of the Chilocco School. Outside, the entire exhibit occupied a reservation of about 10 acres in the northwest corner of the fair grounds. Around the border of the reservation were arranged in a semicircle the native dwellings of the "blanket" Indians, as follows: Beginning at the western end of the semicircle, a Kickapoo bark house; the Maricopa-Pima group in two kees, one tent and summer houses; Arapaho group, one stockaded tepee; Geronimo, the great Apache medicine man, one (decorated) tepee; Pawnee group, ceremonial earth lodge or residence temple; Wichita group, grass lodge, summer house, and one tepee; Pueblo group, two tents and two summer sheds; Pomo group, one tent; Apache group, two tepees. On October first, souvenir lapels of a red feather with a silhouetted Indian head were given out. The Indian Territory later became part of Oklahoma in Nov. 16, 1907 when Oklahoma became a state. 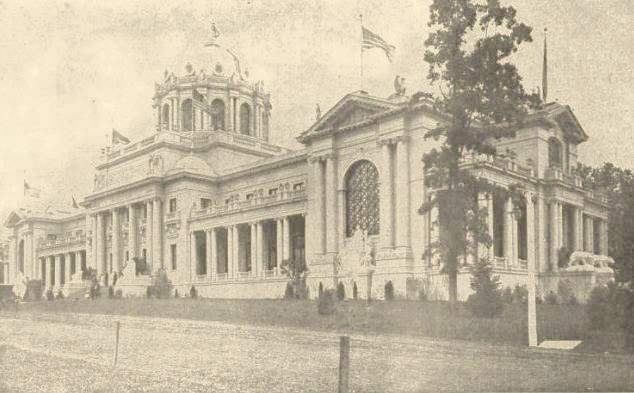 Because of its limited funds the Territorial commission deemed it advisable to make exhibits only at the Palace of Mines and Metallurgy, where the territory displayed the coke and coal, marble, granite, and oil exhibits. 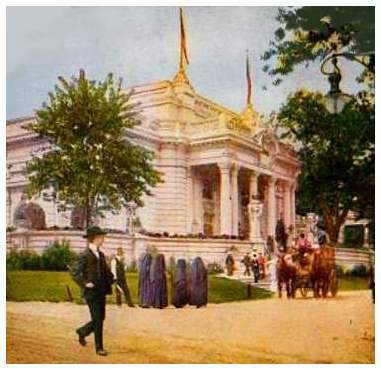 The corn and cotton exhibits were shown in the Palace of Agriculture. In the Horticultural Building, exhibits of the orchards and gardens of the Indian Territory were maintained.